A couple of years ago my regular climbing partner Carsten P. Jensen told me about an exciting article he had read in Climbing about ice climbing in China (download article here). At first I thought it sounded a bit crazy to travel so far "just" to climb ice, but after reading the article and having a great Chinese adventure to Mustagh Ata, I was ready to go! We asked some of our friends to join us, and just a month before our departure Ricka Hea and Martin Ploug joined the team. Two rope-teams - perfect! The team leaving Copenhagen airport - ready for the adventure. Download my packing list here. It was really difficult to get information about the Shuangqiao Valley and the ice climbing conditions as only a few western climbing parties had been there before us - and they were not particularly informative when asked by e-mail..... We got a short article from Guy Lacell, written for the Canadian Alpine Journal 2005, who had been there in 2004 but both this article and the article from Climbing only contained general information. 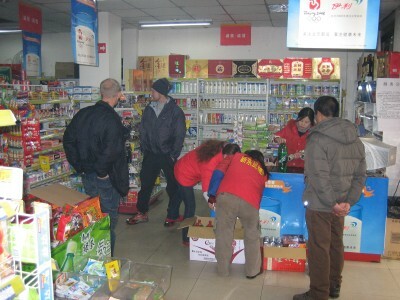 We thus hired the local travel agency Camp Tour to organize all logistics (travel from Chengdu to the valley, hotels, food, permits, local non-climbing guide/translator etc.). They did a really good job and I can highly recommend them! The Binjiang hotel in Chengdu, which kicked us out on the way home due to a Party conference which required all rooms! Communism at its best! Our local non-climbing guide Jeffry looking for English words in his electronic translator. His brother is at the very right. Jeffry told us that he had brought all we needed to eat and drink in the valley, but we were not convinced that he any idea how much sugar and alcohol we would need the next two weeks! The next morning we thus went to a supermarket on the way to the valley. We shopped for ~100 € and I think it was best day of the shop owner in months! Shopping for the essentials: coca cola, chocolate, beer and wine! The Shuangqiao Valley is 6 hours drive north-west of Chengdu (see maps here) on the Balang Shan "high-way", which is a mountain road of varying quality! 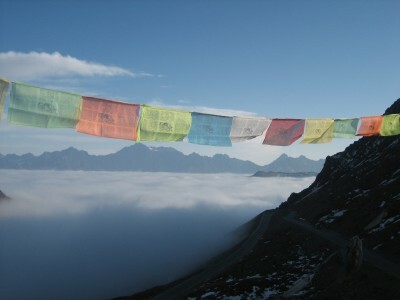 The high-point is a pass at 4500 meters where we stopped to marvel at the beautiful views and a Tibetan shrine. 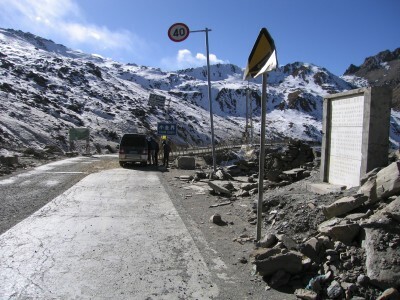 The high-point of the Balang Shan "high-way" at 4500 m.
The valley is located ~500 km east of the Tibetan-Chinese border and is populated with the Jiarong Tibetan people. Tibetan prayer flags, prayer wheels, shrines etc. are thus seen everywhere including at the pass. Tibetan prayer flags - the look back towards Chengdu. Before our departure we discussed many times whether we should bring show shoes or skis for approaching the routes. Due to the lack of information on the valley it was not an easy decision to make but in the end Carsten and I decided to bring nothing (to save weight) and Ricka and Martin decided to bring skis. R & M planned to do some ski-touring on resting days, but as seen below they got really disappointed. There was no snow - even at 4500 m! Looking towards the Shuangqiao Valley from the pass. Mt. Balang is seen in the background. The scenery got more and more interesting as we approached the Shuangqiao Valley. The highlight was a stop to watch the four sisters mountain range. The four mountains are increasingly difficult to climb, and the highest (6250 m) is very difficult and has only seen a few ascents. The four sisters mountain range seen from the Balang highway. 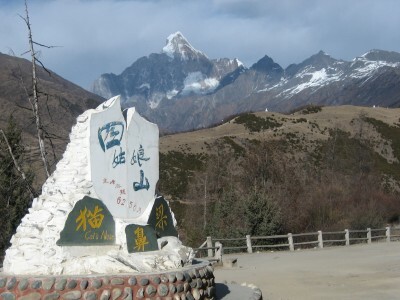 The entrance gate to the Shuangqiao Valley.